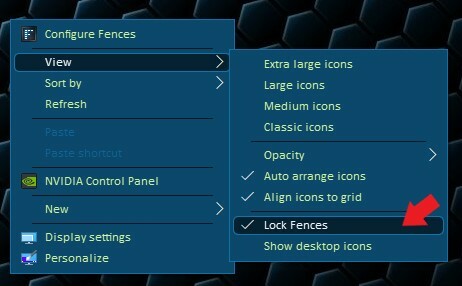 I have fences created and am unable to add any new folders to an existing fence. Sorry to hear you are having issues. Please check if you have accidentally lock your Fences. If you do, please unlock it. Right click anywhere on desktop. What error do you get when you drag an icon into a fence? I just get the circle with the diagonal line through it as if it is locked. I checked and fences and toolbars are not locked. Make sure to re-download the latest version from your account. Install that version and reboot. Retest and report back here. I was having trouble and tried recommendations. The purge worked. Great, glad to know you make it work. Thank you for reporting.